This is a story of all most every one who will wake up early to book a ticket from IRCTC through the Tatkal Scheme. 2. One is happy to see the speed of the site. Because its not 8:00 AM YET!!!! 3. DONG DONG.........its 8:00 AM -- and suddenly the speed of IRCTC goes down....you feel as if your machine has hung up it self....your frustration level starts increasing...you start looking here and there and then would open another window / tab. 4. To your surprise, you are asked to re-login.....and then the wait starts......you wait ... wait ... wait long before you see the booking page under your login..
8. You repeat your steps from step 4 and keep doing it till one fine time either your card gets charged but while coming back to success page you see one of page of step 7. Else, if belongs to the remaining 98% of normal people - we end up calling the agent and seek his help. However, there is a ray of light here.....we can reduce some work and save crucial time at step 6. because the website operates on a first-come first-served basis so if you can fill the reservation form in lesser amount of time, it may improve your chances of getting a train ticket. Here Magic Autofill can help. It’s a simple online tool that will fill the passenger details form on the IRCTC website with the click of a button thus saving vital time. 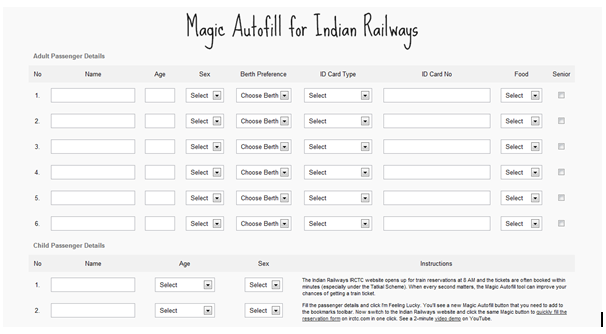 Go to ctrlq.org/irctc around ten minutes prior to the opening of the booking window and complete the form – its an almost replica of the form that’s available on the IRCTC. Once you’ve filled the passenger details, hit I’m Feeling Lucky and the tool will generate a Magic Autofill button that you need to drag to your bookmarks toolbar. 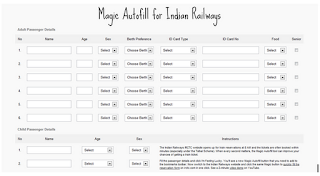 Now when you are on IRCTC site to book tickets, just click the same Magic Autofill button on your bookmarks toolbar and there you are - got all things auto filled up. The reservation form is filled automatically and you can directly proceed to the payment screen. Actually, one is pre-filling a form and saving it as a bookmark. Hence, next when one is on the actual form, one would click the bookmark to transfer the previously filled values to your new form. Hope to see we are able to book tickets with some ease now! IRCTC have to meet the demand of ticket booking aspirants, the web site is too slow and completing a transaction is time-consuming, with the rise in demand is evident from the large number of failed transactions.There is an urgent need to improvise the IRCTC's e-ticketing facility. If Google, Yahoo, Facebook, Twitter etc can handle heavy traffic and not crash even once, why can't IRCTC handle the traffic. IRCTC is getting crores of money on just cancellation of tickets and commission, they can easily upgrade their system if they have a real will to do that.